Today was hair day. Hair day happens every 6-8 weeks, and sometimes it’s more elaborate than others. Today was one of the longer sessions, because I was doing a drastic hair-color change. For the last six or so months, I’ve been trying to make purple dye stay in my hair. No matter what brand I tried, it would slide out within a week or two, even with my stylist, Natalie, doing the work. I liked the purple, it was dark and interesting, but maintaining the purple was a hassle that was driving me crazy. I’ve done many, many colors since 2008, when I added pink streaks to my hair for the first time. I’ve had base colors from dark brown to platinum blonde, and highlights from aubergine purple to cotton candy pink. I even, once, bleached my entire head of hair and had it dyed hot hot pink (but that nearly melted my hair, and I promised Natalie I’d never ask her to do that again). I could go into a long thing about why I dye my hair in technicolored hues, but the bottom line is: it makes me happy, and harms no one. Besides, it’s only hair. If something horrible happens to it, it grows back. 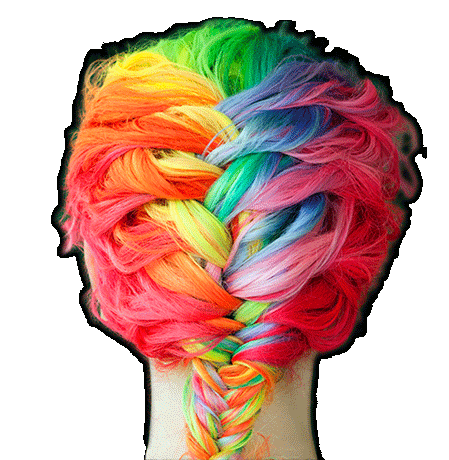 Image is from the Manic Panic website.